I love the Stampin'Up Country Home stamp set. The stamp set makes cards that are perfect for any occasion. I received this gorgeous card from Zahra Premji. 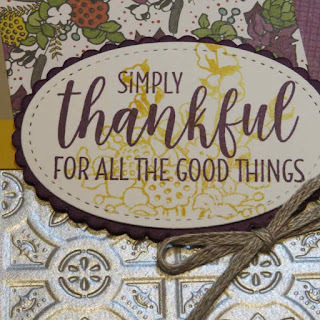 I love how she used the Tin Tile Texured Impressions embossing folder on the new Galvanized Metallic paper. I also like how she added the designer series paper to the top of the card. To order supplies to make this card, please click on a link below.